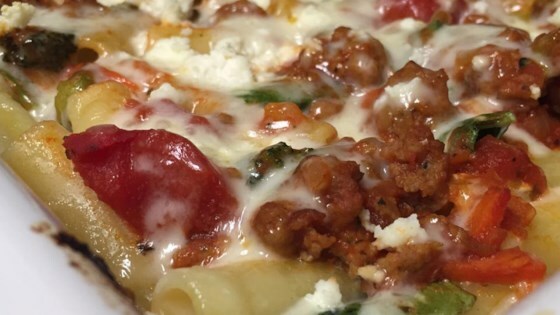 "This easy and comforting dish is made healthier with turkey sausage, lots of great veggies, and less cheese than traditional baked ziti." Bring a large pot of lightly salted water to a boil. Cook ziti in the boiling water, stirring occasionally until cooked through but firm to the bite, 8 minutes. Drain and transfer pasta to a bowl and toss with spinach and sour cream. Heat a large skillet over medium heat; cook and stir sausage, onion, carrots, and garlic until onion is translucent and sausage is no longer pink, about 7 minutes. Add spaghetti sauce and broccoli to sausage mixture and simmer until sauce mixture is heated through, about 15 minutes. Layer 1/2 of the ziti mixture into a 9x13-inch baking dish. Spread 1/2 of the fresh mozzarella cheese, 1/2 of the sauce mixture, the remaining ziti mixture, and fresh mozzarella cheese, respectively, into the baking dish. Sprinkle shredded mozzarella cheese over the dish. Cover dish with aluminum foil. Bake in the preheated oven until cheeses have melted, about 20 minutes. Remove the aluminum foil and cook until top is lightly browned, about 10 minutes more. This was very good and could be turned into a completely vegetarian meal by removing the Italian turkey sausage. This was good with the addition of some dried herbs. I used veggie sausage. I haven’t tried this recipe yet.but there’s a way that a friend showed a different way to make baked ziti.do it rotini instead of the ziti noodles..